The local church lies in the heart of the village and is a Grade 11* Listed Building. A historical medieval church with a rich history. Its founder in the 6th century is believed to be Saint Ystyffan, known by Saint Teilo. The simple building was rebuilt in stone by the Norman invaders who built Llansteffan Castle. You can see the original medieval font in the Lloyd Chapel. The present Nave dates from 13th century and the tower and transepts were added in the 15th century. The tower houses a peal of eight bells by Mears and Stainbank donated in 1875 and restored to ring in the Millennium. The bells are regularly rung by local and visiting bell ringers. The church interior was refurbished in the 1870’s when modern pews replaced the traditional box pews; tablets record that these works were paid for by Henry Parnall. The walls are adorned with an ambudance of fine memorial tablets to local landed families including Lloyd, Meares, Morris, Parnall, Scott and others. The East Window depicting the glory of the creation was designed in stained glass by the renowned John Petts and there are other works designed and executed by the Petts family. 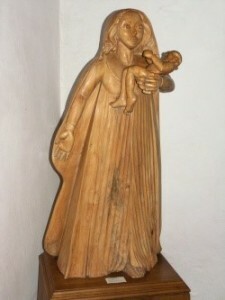 You will also find a limewood carving of the Madonna and Child by John Taulbut. After a lengthy period without a Vicar, when we were supported as much as possible by the Deanery, changes within the Diocese have meant that we have now joined together with other Churches. We are now part of The Benefice of Llanllwch with Llangain, Llangynog, and Llansteffan with Llanybri and Llandeilo Abersywyn. This sounds a lot more that it is as both Llanybri and Llangain Churches have closed in recent years and the old Church of Llandeilo Abercywyn has not been active for very many years. We now have a Priest in Charge covering our area assisted at the moment by a Curate and a Trainee Priest. With further changes expected with the Local Ministry Areas being formed we expect further changes but our faithful band have supported our Church throughout and kept it alive in our Community. 2nd & 4th – Holy Eucharist at 09:45. All are warmly welcomed to attend the service and have a cup of coffee or tea and a chat afterwards. 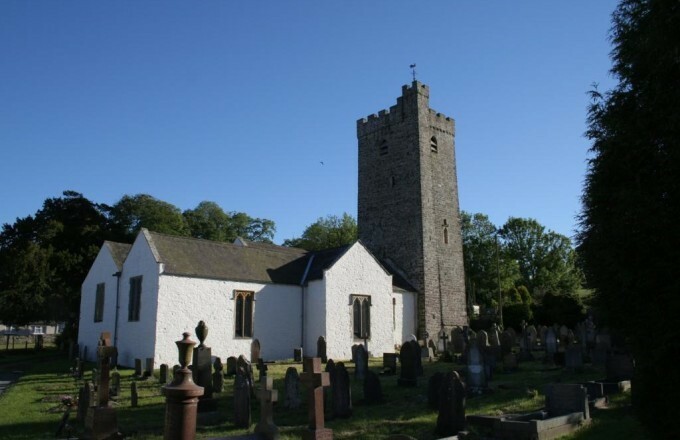 All are warmly welcomed to attend the services at Llansteffan and have a cup of tea or coffee and a chat afterwards. Members make every effort to keep the Church open during the daytime and visitors are welcomed. If for some reason you discover the Church to be locked, please contact the Churchwardens whose details can be found on the notice boards in the churchyard and every effort will be made to help. Details of any additional services and much needed money raising ventures will be advertised on local notice boards, in the community news section of the Carmarthen Journal, in the What’s On section of this Community Council website and in sundry village locations.